The Pesach Seder is the time every year when -- as we declare during the Hagaddah -- we ourselves emerge from Egyptian slavery. Just as the event is timeless, so its manifestations should be studied and analyzed anew every year through the dual prisms of eternity and experience. For four generations, Sfas Emes has been described as “a mirror of the soul.” The work is based upon the Sabbath and Festival discourses of Rabbi Yehudah Aryeh Alter of Gur, over a period of more than thirty years. Profound, scintillating, and pithy, it is incredibly rich in ideas. Great scholars marvel at it, saying that every time they review passages, even those they have seen many times before, they glean new insights. It has been aptly said that what one sees in Sfas Emes is a measure of one’s own spiritual station. But ... the world of Sfas Emes has been closed to the vast majority of those who knock at its doors -- because of a language barrier and the need for a road map through its complex and inspiring themes. Into this breach steps Rabbi Yosef Stern. 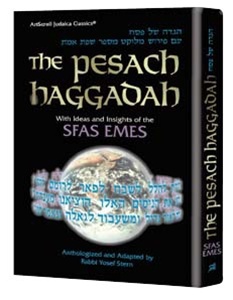 His attempt to capture the essence of Sfas Emes’ thought on the themes of the Pesach Haggadah is a remarkable success. An exceptional Torah scholar and a student of Sfas Emes, Rabbi Stern has isolated the primary trails of thought from many hundreds of discourses and ties them together, topic by topic, into a commentary that is a joy to read, stimulating as well as informative. While the conceptualizations are his own, Rabbi Stern’s work has received the blessings of the Gerrer Rebbe zt’’l a noteworthy indication of the esteem in which the author is held. This work gives us a mirror by which to encounter ourselves. But it is more. It is an entry pass to the portals of some of the loftiest and most enlightening thought of the last century.